The Aainda Foundation (Aainda means ‘future’) aims to improve the quality of schooling in Afghan girls’ schools by providing modern school supplies and educational facilities like computers and internet access. 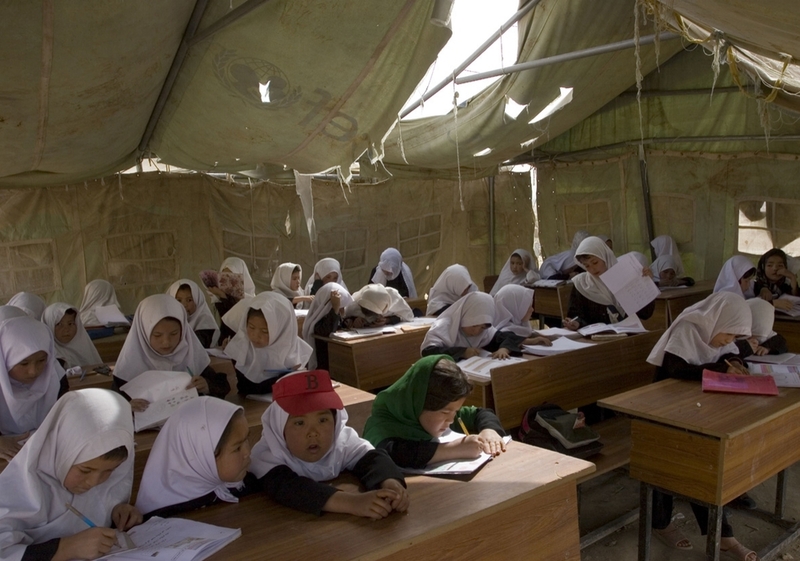 Initially, our focus will be on two specific schools in Kabul which account for 6,000 pupils. New technologies, internet access, and with it, free and open access to information from across the globe are essential tools in enabling these girls to fight for their future positions as emancipated women and valuable members of society. By providing them with access to information, they can learn about the rights they have and how to build an independent existence, free from dependency and violence. It will help these young women to recognize their own strength, and to use that power to contribute to the reconstruction of their country as equal members of society. In May 2015 I went to Kabul to help the two selected girls’ schools – Sir Asia and Nahjube Herawe – with basic school equipment. We had the possibility to help only 200 primary school pupils with the money we had collected so far. We decided to fill 100 school backpacks per school, each filled with a variety of 10 kinds of school supply. Before I could go and hand out the school materials to the girls, I had to ask permission from the directors of the schools. Not everyone can enter the schools, because it might be dangerous for the children. With the help of neighborhood representatives we eventually got the permission. They also helped to find a smaller school when it turned out that we could not offer our school supplies to the Mahjube Herawe school. The director of that school wanted either to offer all 400 children a backpack or no one, since she was afraid that others would get jealous. These neighborhood representatives then helped to contact the Mermon Khajo school. We handed out the school supplies on different days at the two schools. The children were very happy. We had asked Mohamad Musa, a photographer, to join us in order to record how the children responded to the gifts. Also in order to be transparent to our donators and to show to whom the school materials have been handed out. We also asked the children to make a drawing for the donators in order to thank them. We have photographed them together with their painting – proudly smiling. There have been several moments that I was deeply touched. The first time was at Sir Asia school, when I noticed we had two backpacks shortage. I told the teacher, who checked the list and discovered that two girls of 7 years old had sneaked into the classroom, in order to get a backpack as well. The teacher expelled them from the classroom. They left with tears in their eyes, because they came also from poor families but they got nothing. I felt very sad for them, and I went to arrange extra backpacks especially for them, on my own account. I could not leave them without anything. The second time I was deeply touched was at Mermon Khajo school. In this school boys and girls were in the same class. We decided also to hand backpacks to poor boys in the classroom. When the first boy in the classroom received a backpack full of school supplies, he was so happy that he hugged his backpack with tears in his eyes. To improve the position of young Afghan women by investing in modern school supplies and educational facilities. To foster solidarity between Dutch and Afghan people in the Netherlands. Fundraising. We have received a subsidy from the municipality of Maastricht, which recognizes our foundation for its contributions to social integration of migrants and globalisation of the city. In addition, there are several organisations that have expressed their interest in funding Aainda activities. We are currently in the process of writing funding applications for those organizations. Organising charity events and participating in public events by offering Afghan food, fashion shows featuring Afghan clothing and music, and by selling traditional Afghan clothing, various other Afghan products, and the cooking book Moeder’s Gerechten (“My Mother’s Recipes”) that was written by our chairperson. We intend to introduce people to a positive perspective on Afghanistan in as many areas as we can. All of these activities aim to improve mutual solidarity. Organising cooking workshops, sewing workshops, and traditional Afghan arts and crafts. The things we create in these workshops are also sold to raise additional funds for our cause. In addition, our activities offer a safe and familiar space for women to come together and share their life experiences. We notice a pressing need among Afghan women to build a local social network to rely on for help with practical and social/cultural issues they encounter. Lectures on Afghanistan for local high schools. We hope to inspire these students to reach out to their peers in Afghanistan over the internet. It may also encourage them to collect useful materials to send to Afghan pupils to help. Organising a conference on International Women’s Day (8th of March) for women who would like to help improve the position of women in Afghanistan. Clearly, these two goals are intimately interrelated. We hope that increasing solidarity between Dutch and Afghan people in the Netherlands will cause Dutch people to feel more closely involved with the fate of Afghanistan. For that cause, we hope to find financial, material, or simply moral support for Aainda.